A week from right now I'll be heading into the last of three Christmas Eve performances, then we'll come home to a double batch of Crock Pot Lasagna, jammies and How the Grinch Stole Christmas. A week from right now all the shopping will be done, presents will *hopefully* be wrapped, packages will be mailed and I'll have children excitedly talking about how many cookies to put on Santa's plate and how full we should fill his glass with milk. A week from now our house will be filled with more family than it usually holds, bursting with laughter and games and lots of snuggling. A week from right now there will be no thoughts of school or what goes on there; homework or getting it done. But, right now... in this moment... I'm sitting for a bit. 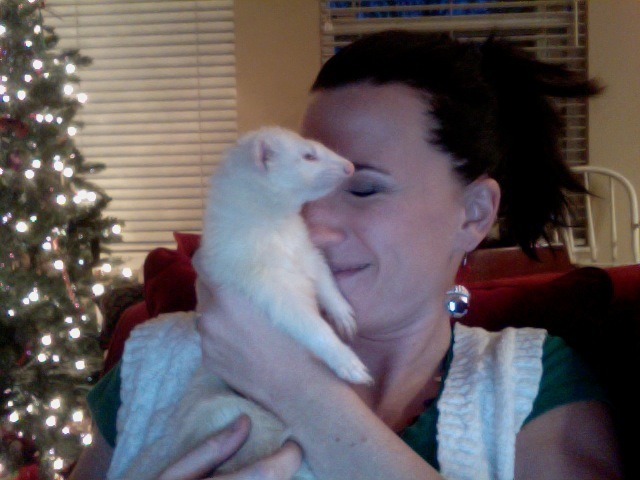 We're ferret-sitting for Ian's class. There is much that will come between now and a week from now. So, I'm just going to sit for a bit. 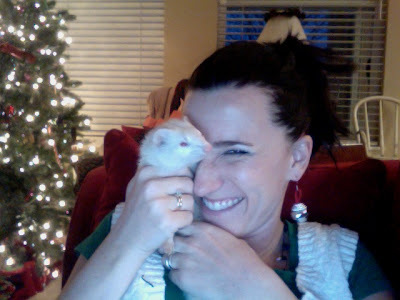 Me and my new friend-for-the-holidays, Rosie.